Sharpest downturn for almost 6 yrs. Germany and Italy were notable contributors to the stronger decline. Demand hit by weakness in domestic and export markets. 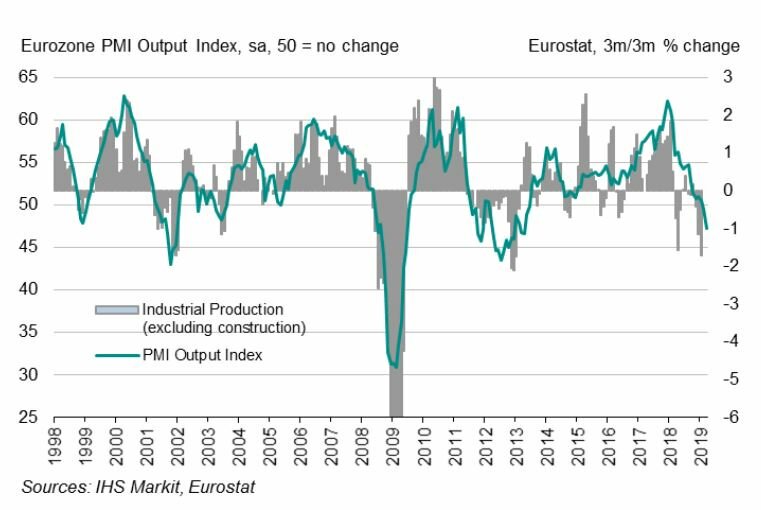 "Manufacturing operating conditions in the eurozone deteriorated in March to the greatest degree for nearly six years, according to the latest PMI® data from IHS Markit. After accounting for seasonal factors, the IHS Markit Eurozone Manufacturing PMI posted a level of 47.5, down from 49.3 in February and its lowest level since April 2013. March marked a second successive month that the PMI has posted below the 50.0 no-change mark." The overall downturn was led by Germany, where operating conditions deteriorated to the greatest degree in over six-and-ahalf years. Italy fared little better, with its PMI at a near six-year low. France returned to contraction, having recorded modest growth in the preceding survey period. In contrast, Greece saw its manufacturing sector enjoy its best month of growth in a year and thereby buck the wider regional trend. The underperformance of the manufacturing economy was closely linked to a deteriorating demand environment. According to the latest data, orders books contracted to the greatest degree since the end of 2012. Export orders* were down at the sharpest rate since August 2012. “The March PMI data indicate that the eurozone’s manufacturing sector is in its steepest downturn since the height of the region’s debt crisis in 2012. The survey is indicative of output falling at a quarterly rate of approximately 1% in March, suggesting that the January rebound from one-off factors late last year seen in the latest official data is likely to prove short lived. “Looking at the forward-looking indicators, downside risks have intensified, and the trend could clearly deteriorate further in the second quarter. New orders are falling at a rate not seen since 2012, and disappointing sales mean warehouses are filling with unsold stock. The orders-to-inventory ratio – a key indicator of the future production trend – is at its lowest for almost seven years. Expectations of output for the coming year are also the gloomiest since 2012. “Concerns over trade wars, tariffs, rising political uncertainty, Brexit and – perhaps most importantly – deteriorating forecasts for the economic environment both at home and in export markets, were widely reported to have dampened business activity and confidence. Levels not seen since Eurozone sovereign debt crisis. Weak demand continues to harm German goods producers. 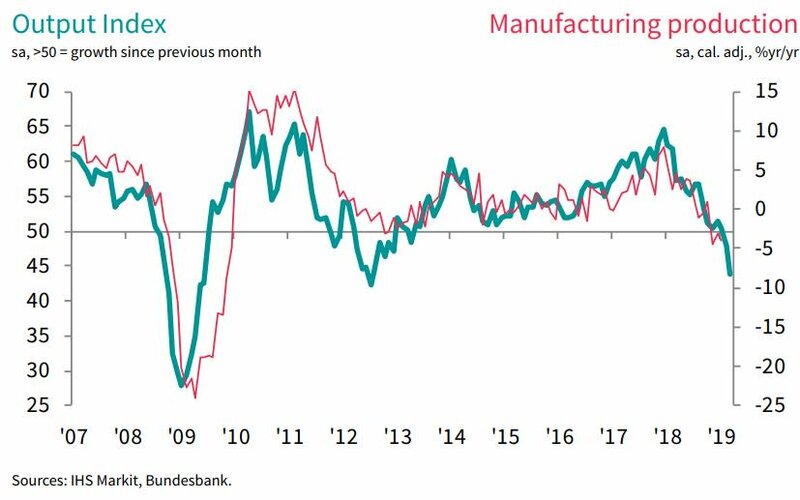 "Germany's manufacturing sector sank deeper into contraction at the end of the opening quarter, with latest PMI® survey data from IHS Markit and BME signalling faster decreases in output, new orders and export sales. There were signs of sluggish demand and an uncertain outlook affecting firms' employment decisions, as payroll numbers fell for the first time in three years." The report also highlighted easing supply-side pressures, with input lead times improving to the greatest degree since mid-2012 and purchase prices rising at the slowest rate in over two-and-a-half years. The headline IHS Markit/BME Germany Manufacturing PMI – a single-figure snapshot of the performance of the manufacturing economy – dropped sharply in March to 44.1 from 47.6 in February. This was the lowest reading since July 2012 in the midst of the eurozone sovereign debt crisis, and also below the preliminary 'flash' figure of 44.7. Manufacturers' growing reluctance to extend contracts also reflected a further weakening of confidence towards the outlook for output. Sentiment on this front was the most pessimistic since November 2012. "The final print of March's manufacturing PMI numbers makes for uncomfortable reading, with the downturn in the sector even worse than initially suggested by the 'flash' data. Both total new orders and export sales are now falling at rates not seen since the global financial crisis, with more and more firms reporting lower demand linked to Brexit and trade uncertainty, troubles in the automotive industry and generally softer global demand. "Manufacturing output fell markedly and at the fastest rate since 2012, with the consumer goods sector joining intermediate and capital goods producers in contraction. "The sustained solid growth in employment prior to March had been the sector's one remaining bright spot, but the latest survey indicated a fall in jobs for the first time in three years amid reports from a number of firms that some temporary contracts weren't being renewed." New order growth eases to near-stagnation. 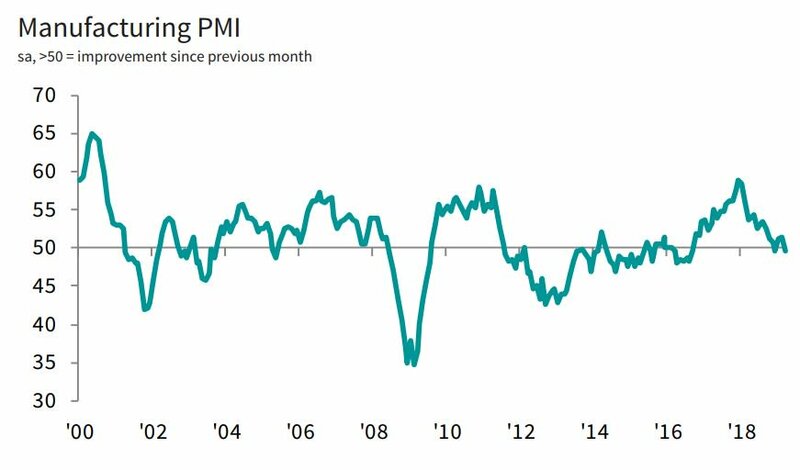 "Dutch manufacturing conditions improved in March at the slowest pace since June 2016, according to the latest PMI® survey data from NEVI and IHS Markit. Although new export orders rebounded following February's stagnation, total new work increased at the slowest rate in over three years." Output increased at a slightly faster pace, but companies' 12-month expectations for production were the lowest since November 2015. Subsequently the rate of job creation in the manufacturing sector lost further momentum. More positively, manufacturers continued to increase employment in March, extending the current series-record sequence of growth to over four years. That said, the rate of job creation was the slowest since June 2016. “The PMI for the Dutch manufacturing sector edged lower in March on the back of a near-stagnation in new orders and a weaker rate of job creation. Over the first quarter of 2019 as a whole, the sector has witnessed the slowest improvement in business conditions since Q3 2016. "The small margin of the drop in March, at just 0.2 points, reflected stronger contributions from output, stocks of purchases and suppliers' delivery times. These partly reflect short-term preparations for Brexit, however, while the 12-month outlook for production is the weakest since November 2015. "More positively, the Netherlands continues to outperform the eurozone as a whole, which saw the strongest manufacturing contraction in nearly six years in March*". "Manufacturing business conditions in Italy continued to worsen in March as a sharp reduction in new orders led to a further decline in output. Production fell for the eighth consecutive month, whilst new orders contracted at the fastest rate in nearly six years. Meanwhile, business confidence dipped slightly from February, but was nonetheless positive." Amid reports of greater raw material prices (notably iron and steel), cost burdens rose in March. That said, the rate of inflation softened from February to a modest level. Despite this, firms raised their own charges at a quicker pace compared to the previous month. Optimism regarding the year ahead outlook for output was sustained in March, but concerns over further contractions in customer demand and a continuation of negative market trends meant sentiment weakened from February. 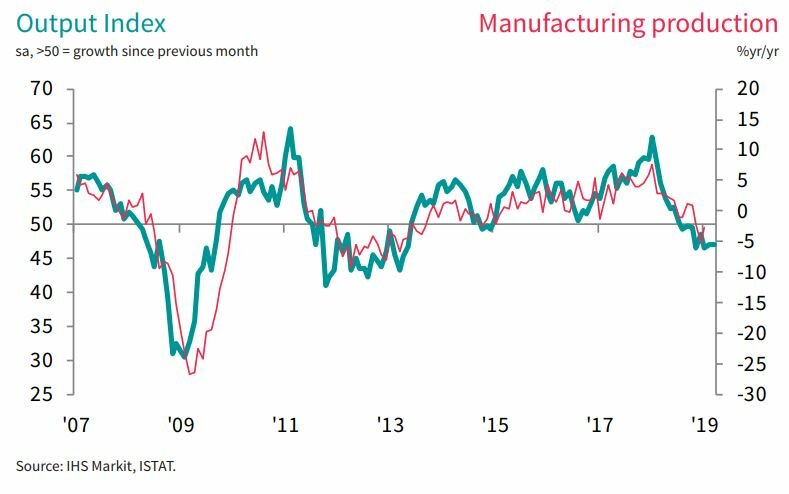 “PMI surveys are used to provide an indication of the health of a particular sector or economy; and latest PMI data for Italy's manufacturing sector signalled an ailing industry. Production, total new orders, export sales, employment and purchasing activity all fell, with overall new business contracting at the fastest pace in almost six years. Moreover, headline data for operating conditions was at its worst since May 2013. "Brightspots were centred on prices data, which showed a softer rise of cost burdens and more confidence from firms to expand their margins by raising their charges. "All in all, Italian manufacturing output looks set to decline further in Q2, especially when looking at slowdowns in key sources of external demand in neighbouring European markets." "Following improvements in the first two months of 2019, business conditions in France's manufacturing sector deteriorated during March. The marginal decline was driven by renewed contractions in output and new orders, while export sales fell at the quickest pace for three months. Consequently, firms increased staff numbers at the slowest pace in 2019 so far, and input buying declined at the fastest rate for two-and-a-half years. Input price inflation eased to its softest since October 2016"
On the price front, input cost inflation eased for the fourth month in a row during March, reaching its slowest rate for nearly two-and-a-half years. That said, the latest increase in costs burdens was still sharp overall, with panellists citing higher raw material prices. Manufacturers expect output to be higher in 12 months' time, but the level of positive sentiment fell to a three-month low in March. Concerns of weak underlying demand weighed on confidence. 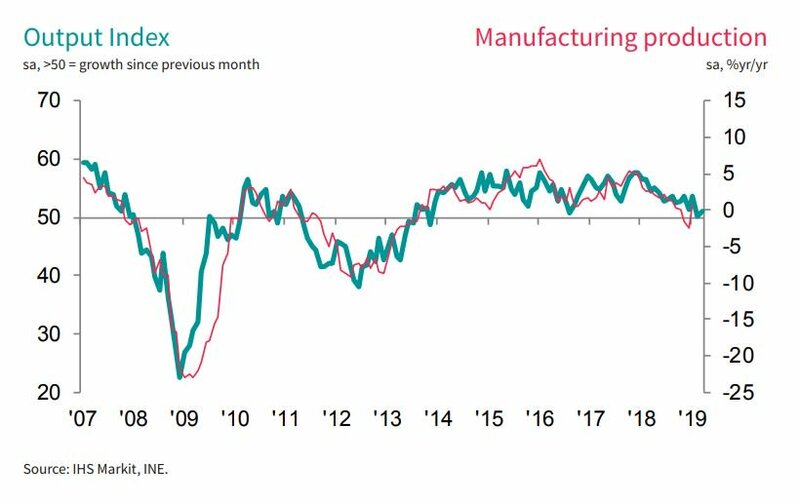 "Unfortunately, France's manufacturing sector could not maintain the upward momentum seen at the start of 2019, as business conditions slipped into deterioration during March. The weakness was driven by a poor performance in new orders and consequently a renewed fall in production. "The results are worrying given the continuation of social unrest. As long as the 'gilets jaunes' protests remain prominent, domestic demand will be subdued and there is seemingly no support from exports. The dismal performance of international sales continued into March, with a seventh consecutive monthly reduction in new export business registered. 50.9 Vs 49.9 in Feb.
"Spain's manufacturing economy returned to growth during March. However, the expansion was marginal amid only slight gains in output, new orders and employment. Price pressures also remained subdued as previous supplyside constraints showed further signs of softening over the month. Confidence about the future was little changed." With input costs up only marginally, and demand conditions subdued, output charges were raised only slightly in March. Finally, confidence regarding future activity remained in positive territory during March. There were positive projections for sales and hoped for success from new product launches. However, uncertainty stemming from upcoming elections, plus worries over the strength of underlying demand in European markets served to restrict optimism. 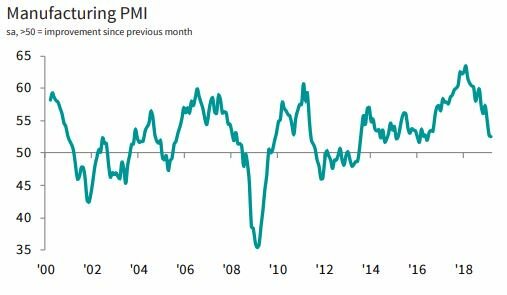 "Spain's manufacturing sector saw a slight improvement in its headline PMI during March, but underlying conditions remain fairly subdued. Indeed, the data remain consistent with the sector stagnating and contributing little to overall economic growth in the first quarter of the year.